After all the sweet treats have been eaten, it is so important to make sure that my kids’ teeth are kept clean to prevent cavities. Colgate Kids Oral Care Line offers a plan of attack against sugar and bacteria which can cause significant tooth decay when excess amounts of treats are consumed. I have used Colgate for years and appreciate that they have a specific line of products created just for children. I have found a trick that when my children “like” their toothbrush they are much more willing to brush their teeth. Colgate Kids have fun characters like Dora the Explorer, Sponge Bob Square Pants and Bakugan. For older kids there is the Pop Stars 2 in1 toothpaste and for babies there is “My First” toothbrush and toothpaste. 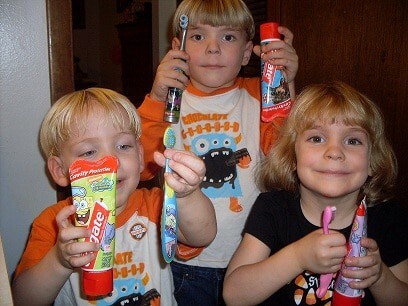 When my kids saw their new Colgate toothbrushes and toothpaste they made up all sorts of reasons to brush their teeth. My five year old used his new Bakugan Spin Brush for the first time and said that it “felt good on my teeth.” He easily brushed for the recommended two minutes. I liked that it has multi-height bristles to make reaching his back teeth easier. I usually finish by helping him brush his back teeth but this time he was able to do it by himself with supervision. The Colgate Kids toothpaste is clinically proven to prevent cavities and best of all my kids loved the taste. This Halloween consider giving out Colgate Kids toothbrushes and toothpaste as party favors or as a surprise for your kids on Halloween night. Colgate Kids has a really neat website including games and activities for your kids. Check it out. like the spongebob tootbrush the best. i like the frog humidifier from crane from your store. I son would love the spongebob toothbrush. Love Colgate, we have the spongebob toothbrushes and would like a new one! My son would like the green one. I like the Dora battery toothbrush! Any of them. Any toothbrush/paste that would prevent brushing to be a hassle is the one I want!